Previous thread was getting too long. By request, new one is started here. Link to previous thread will follow. Don, did not particularly have any history to provide on this bug -Though I wish he did, I love to know the back story who ever made it really did a nice job. it is interesting that the engine/metal frame is set like a power unit on a wholly wooden chassis. It interests me that the blocks holding up the T frame are scalloped or thinned toward the top, this seems like an unnecessarily detail. There was also a fair bit of care in that the battery box and starter button are nicely mounted with easy access to the carb. Wow, that is very interesting. I too was noticing that the T frame was on top of another chassis. And it does at least appear that it would indeed fire right up with little effort. Nice find for sure. Wow! That's cool. I really like the chain drive. So, as we prep for yet more snow here in Boston, the following article appeared in the Globe the other day. 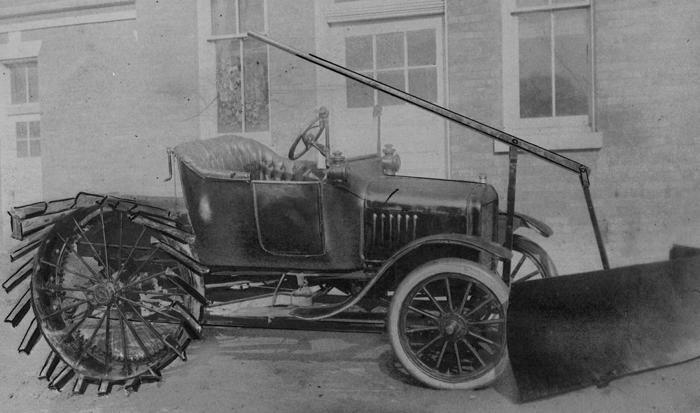 According to it, the City's first motorized snow plow was a T conversion tractor (see picture about halfway through). Two things i wonder about,and first i wonder if the angle blade just pushed the lite Ford front end?? Next i wonder how that was Bostons in 1914?? Bud. "Artist Rendering" or "Creative License"
Either way, it is still cool. I like the rear tires on the Doodlebug that has the driver with the yellow shirt. Nice looking tractor!! Sorry,What i tried to say is with that angle blade would the snow slide or the Ford? Bud.I can remember seeing a model A Bug set up like that! Bud. 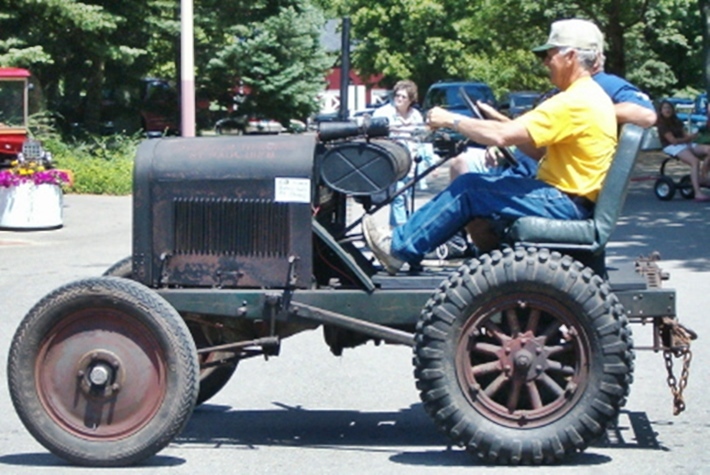 The rear tires on the doodlebug with the driver in yellow are apparently manure spreader tires, although I suppose they were used on all sorts of ground driven equipment. I went looking for a pair of those some years ago on behalf of my father in law I didn't have any luck at the time. I did find several old ones at a farm one set looked fantastic until closer inspection they were totally shot where they had been touching the ground. I would love a set of them though, they are a neat pattern. 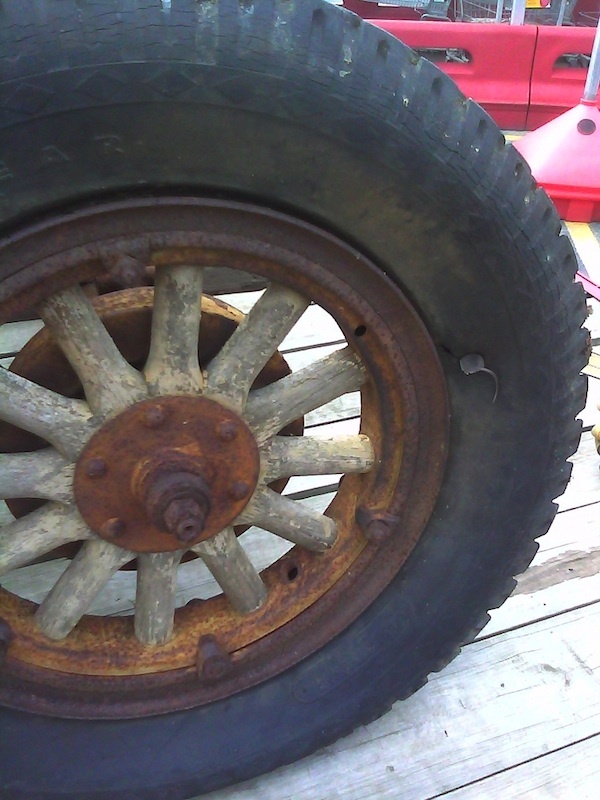 I learned first hand with my trailer tires how the bare ground erodes the tires. I now have to replace all 4---which I should do any how due to age alone. I am itching to make a set of skis, or get a plow mount made, but it is just to dang cold out and takes to long to heat the garage up. I'll get them done this year and then we'll have no or little snow next year. Zac made a beautiful set for his. I had a set I was chasing on Craigslist about a year ago and was harassing Zac about making me a set of the wood pieces for them (but they disappeared off Craigslist). The great thing about running skis on a bug is you can forego the tandem setup and tracks if you have lugs on the back (steel or ag tires). I agree about the cold I would love to get out in the garage this week and tear out the doodlebug's engine and the extra transmission but it is too cold. My second transmission kind of succumbed to stupidity last fall, I took off the tower to check things out after running it for a while after the new bearings and such were installed. One of the tower bolts went missing I looked for over an hour trying to find it, I thought I looked inside but I guess not well enough because the first time I moved the doodlebug I found the bolt, along with the transmissions oil where it had been driven through the side of the case. Not sure if this one was in any of the early photos of this thread. The guy lives out in western NY. 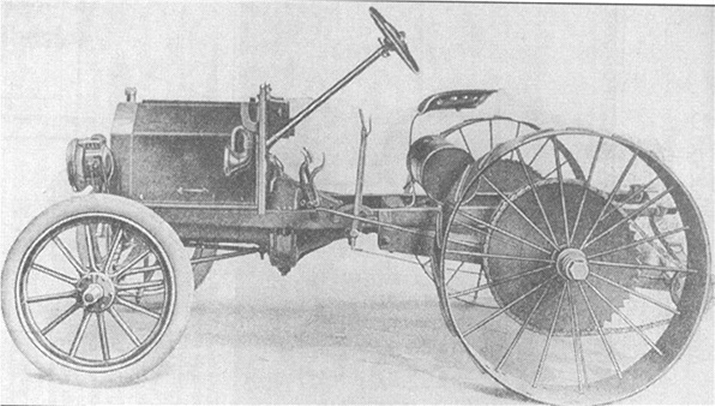 note the length of the engine. 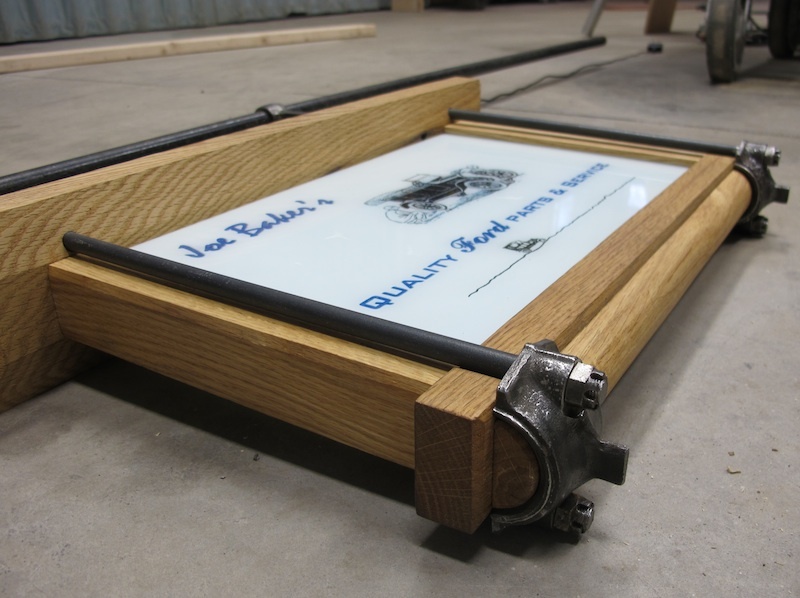 Note in the second picture the connecting rod bolted to the frame; I am curious what that is for. I wouldn't have the heart to cut a good engine down but it would be pretty neat to have one of these engines. Keep them coming!!! I like the tread on the front tires. Another neat bug!!! I keep one of those signs up at all the shows I go to as well. #1 or 2 rod probably broke the block so he shortened it. Someone had some talent putting her together - they bent those frame rails in and narrowed the front crossmember. 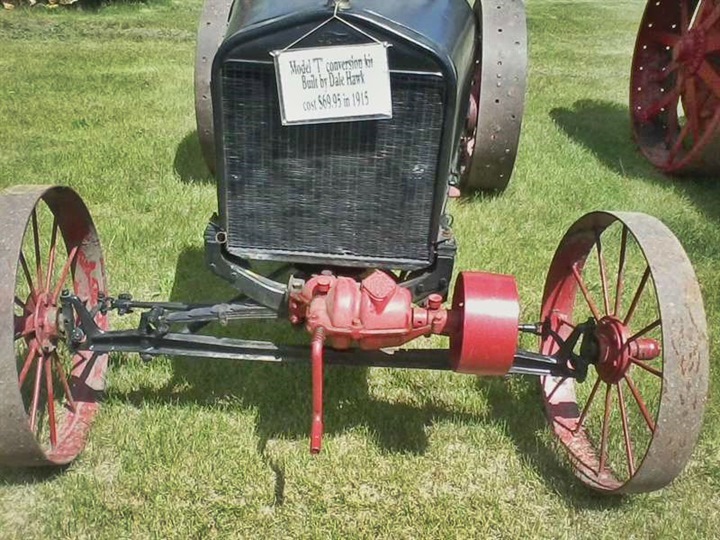 Usually, you only see the front axle narrowed. Looks like a really clean job. 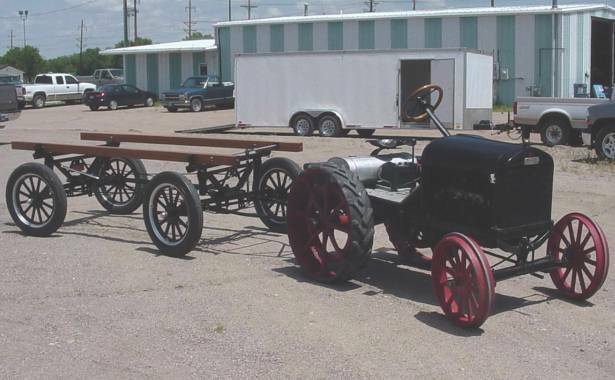 This farmer built tractor conversion utilized parts from two International Harvester horse drawn grain binders. The drive wheels of the tractor are the bull wheels from each of the binders and the front wheels are the header wheels. 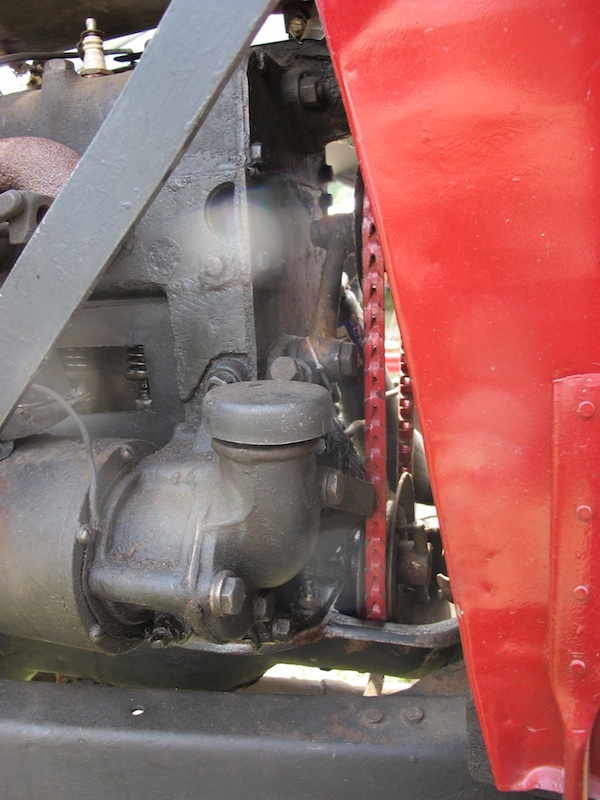 The tractor features an E-Z Power flat belt power unit and a Warford auxillary transmission. 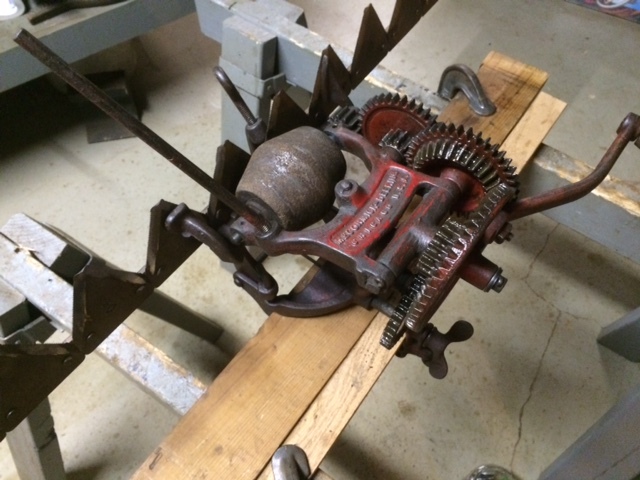 The tractor is chain drive using the cast sprockets from the binder. 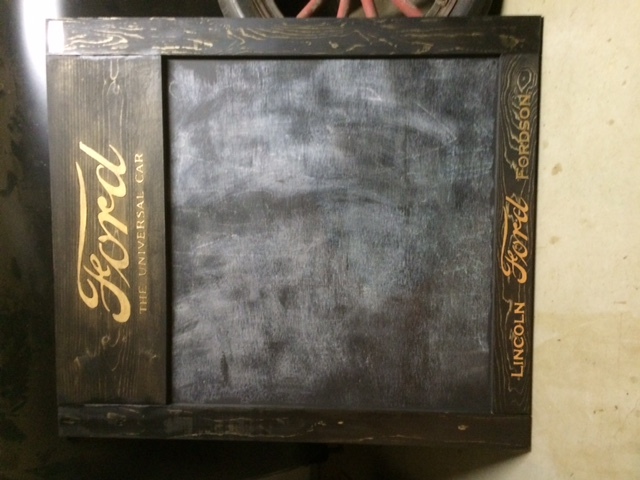 I'd hang it in my garage, but the garage isn't nice enough. I really like the look I am sure the pictures do not fully do it justice. 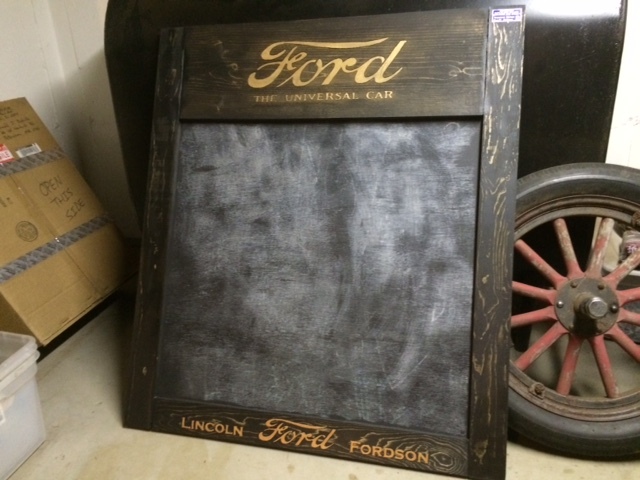 Your son now has me thinking about an old slate chalk board that has been living in the back of a garage that we keep the tractor in for as long as I have been alive. -Several years back my father in law was building a garage and spending far too much time making it look nice. 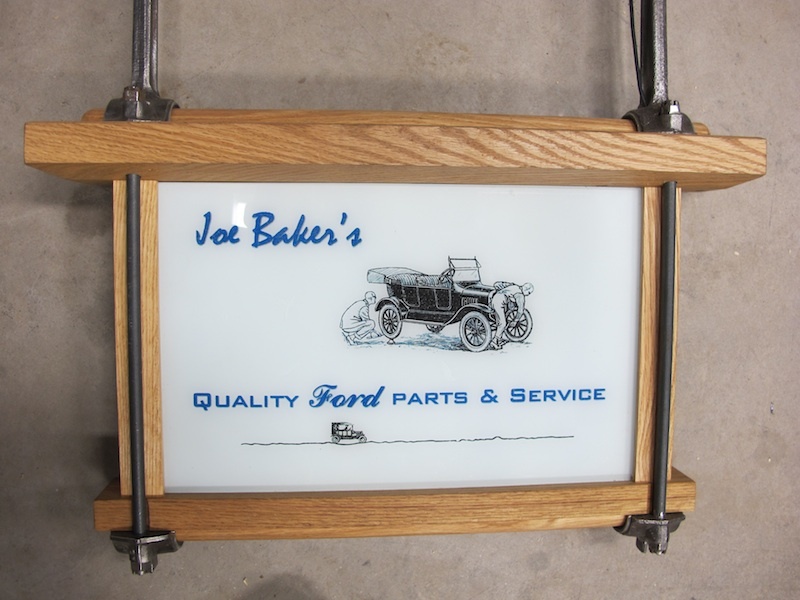 I made the following sign for him using some old window glass which I etched, then applied the image. It is the same on both sides and has lighting inside. I didn't think about aging the sign as your son did; the wood here is oak, so ammonia fuming would have been a nice effect and would have gone along with the period nicely. The connecting rods might have been from an old Chevy? kind of ironic.. or maybe thats all they are good for.. ok just kidding. nothing against an old Chevy I just couldn't afford one; T's are more my price. maybe some day in an old barn I will find some old Frontenac parts then I can have the best of both worlds. Damn there are some talented people here. I don't even consider myself in the same league. Donald, I didn't realize you posted in the Part 1 doodlebug post. Anyhow I had responded, did you have any still pics of your tractor? When reading the early posts in this thread series I had really liked the front mount PTO's like the EZ-Power Donald has. I think that is what draws me to Model T's and especially doodle bugs, there are just some many variations on the T theme. Last year I was given a rear mount PTO for a T-engine to be used as a power unit from a neighbor, and I had previously found a bully with mounting boss and right angle bevel. Hmmm, maybe a project for someday. 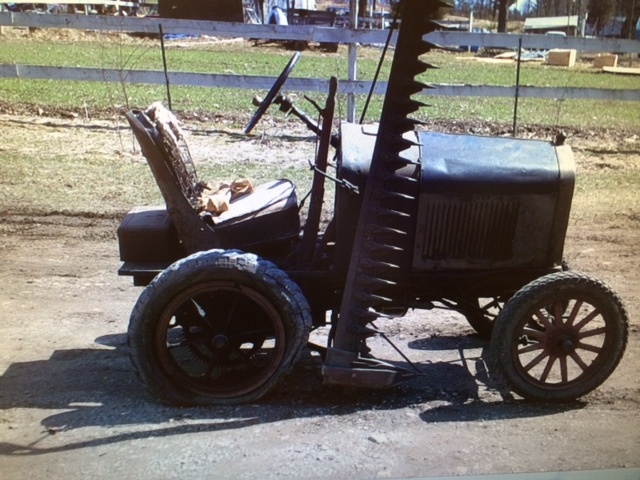 -On my way home from work this evening I passed an old manure spreader rear end peaking out from the snow in someone's front yard and got to thinking about the sickle bar mower based doodlebugs from PA from the older threads. 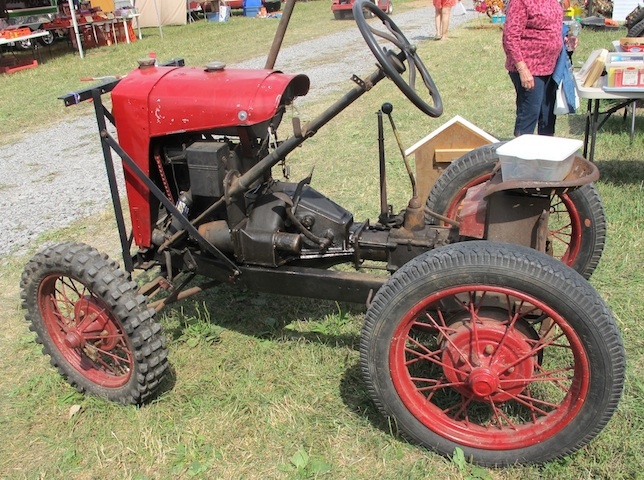 The 'bugs were driven via a pinion attached to the geared wheel, but this raised some questions for me: Do sickle bar mowers have a differential, solid axle or solid axle with a ratchet on the non-drive wheel? If the mower had a ratchet mechanism (the most probable option given the era) on one wheel that would mean that there would be no reverse right? Zachary, I continue to be amazed at the plethora of variations and farmer ingenuity our forefathers devised to make their work a little easier, or faster or more efficient. This is my Shaw conversion. 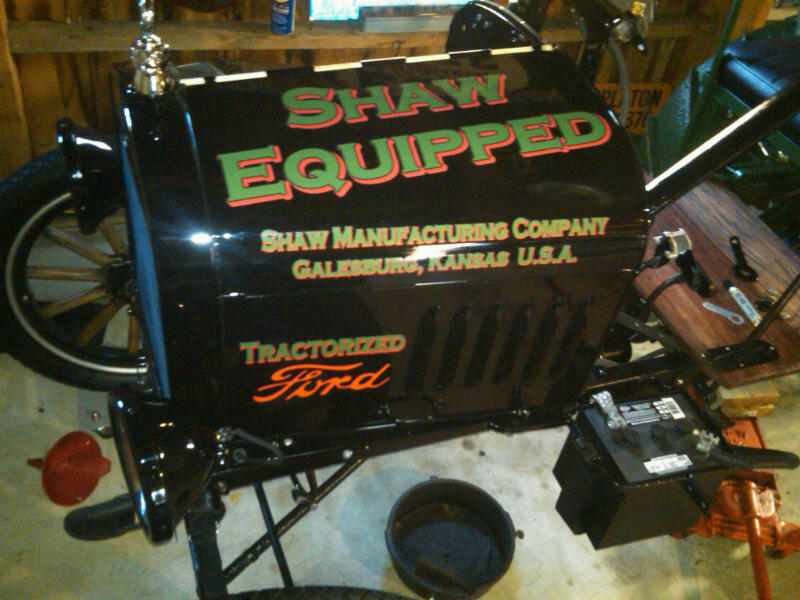 It was converted from a kit available during the depression from Shaw Manufacturing in Galesburg, KS. 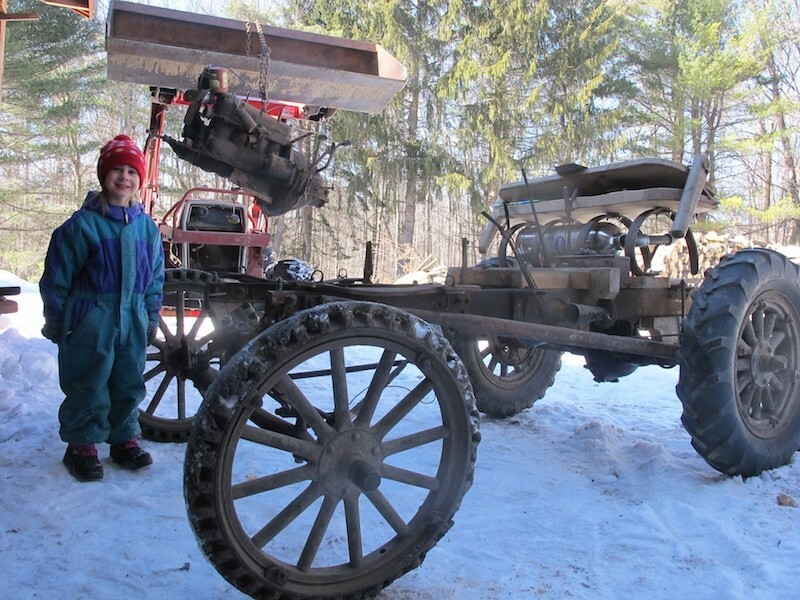 This unit was narrowed in order to use the tractor to pull a maple sap tank sled through the sugar maple forests of New Hampshire where the tractor spent it's entire life. 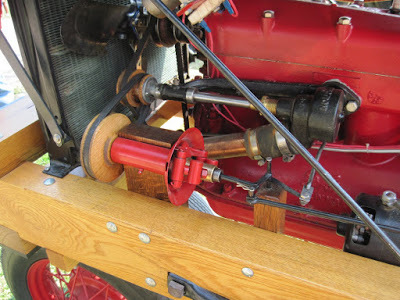 My '27/IHC conversion is set up like my Shaw - idler axle with a bull gear that is driven by a T-axle. It has a reverse. The mower is not engaged constantly - you have to put the mower in drive with a lever (which, in the case of mine, is another old T e-brake handle). 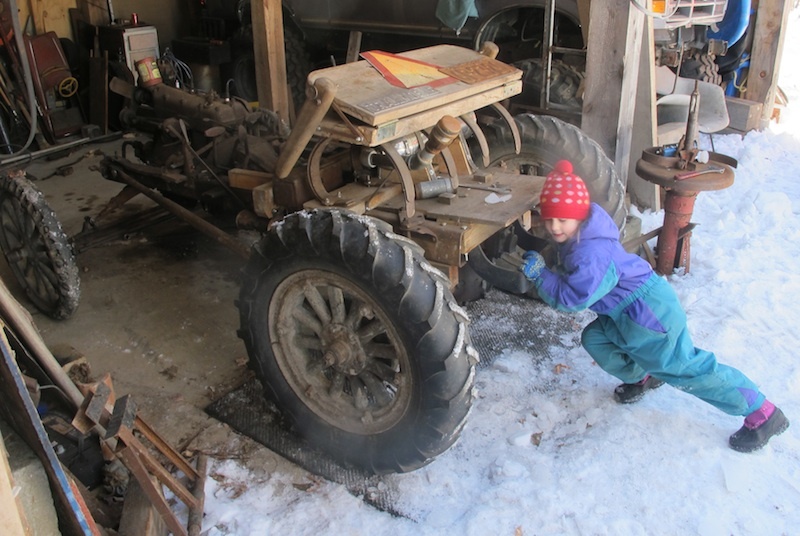 I only got her running semi-reliably in late autumn (right before I tucked her away from the 8' of snow we've received) and the cutting bar was not attached when I was running her. You raise an interesting question and I look forward to investigating it further when I dig her out this Spring and hook the cutting bar up. I have been looking at pictures of you and your Shaw on the internet since I found mine about 3 years ago. Nice to finally "meet" you. 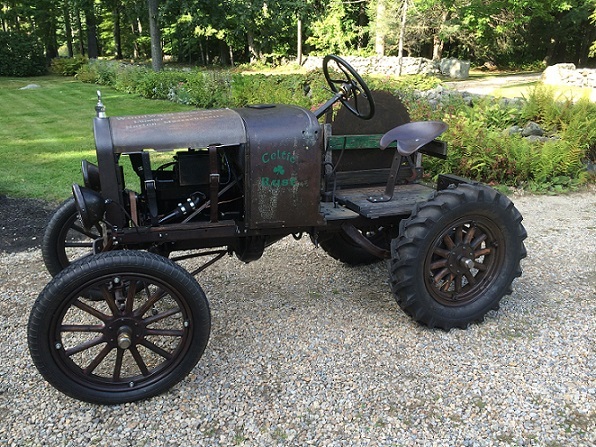 Your Shaw is BEAUTIFUL and I am so envious of those front wheels (mine disappeared somewhere along the life span of my girl and I have been looking for a set since I dug her out of the basement of an old barn outside Philadelphia where she had sat for about 40 years). ANY time you want to get rid of your Shaw OR your T/IHC hybrid, I will HAPPILY hook my trailer up and haul them back to New England to join their sisters. Your Shaw is AWESOME Ron !! I especially like the "Tractorized Ford". What does the lettering on the top of the hood say? If I ever run across a set of Shaw cast iron fronts... they are yours! I appreciate the extra eyes in Colorado looking for those wheels. Including yours and mine, I know of less than a dozen T-based Shaws in existence. The national Shaw-collectors club were only tracking 1 before I sent them a picture of mine. 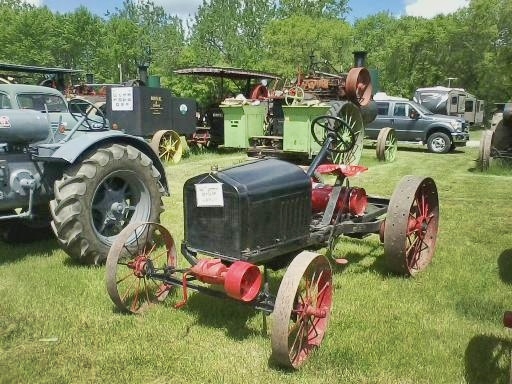 My doodlebugs and conversions get a ton of attention at tractor shows - people can only look at so many Farmalls and John Deeres before they all begin to look the same. 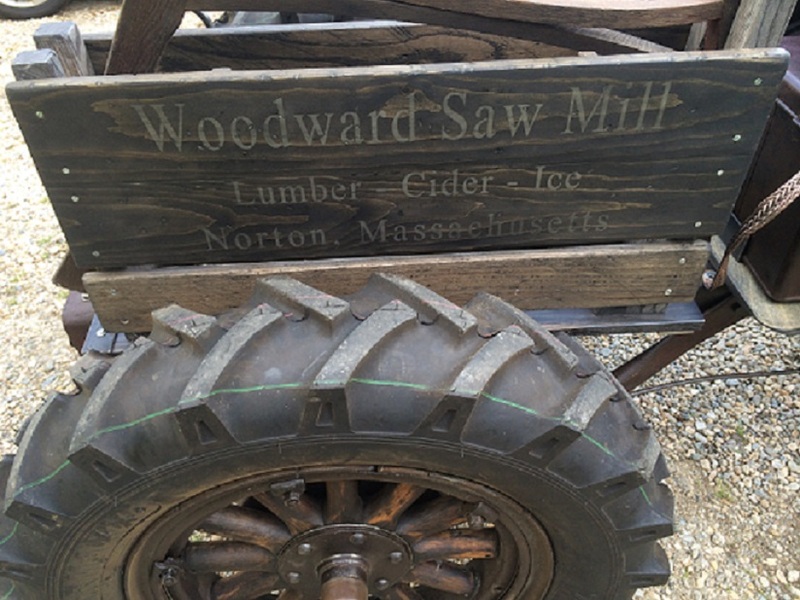 Finished the wheels and rims for the sawmill. Refurbished 4 really rough firewalls (one for the power unit, one for an engine stand that came with the sawmill and two for future projects not yet acquired). Cleaned and tagged extra parts. Running out of things to do in the basement - everything I need to work on is a prisoner of the 100" of snow we've gotten so far this season. Cannot get out to the barn. More due in tomorrow and mid-week. Need to put a new clutch in my AA puller, but it's too damned cold in the garage to start pulling an engine. Ron, that's my favorite of all of your bugs, for obvious reasons.. Very cool, thanks Ron. I will have to look out for that road when the snow melts and and my T is once again where it belongs,...on the road..
Ron, Love the close ups. If it weren't for the job and kids I might have an engine that looked that good.. Funny thing I have generally tried to leave the engine grime in place on mine so that it would look pretty much like it was found, but I love the way your bugs look with things thoroughly cleaned too. With major engine work now necessary to stem oil consumption I am a bit at a loss because the engine will inevitably have to be cleaned for the machine work. The Shaw decals look great I suppose hand lettering is just going to get more expensive as the older generation who had no computer based option are retiring/passing away. Hand lettering like that is a real talent. It's funny to think that my mothers work van back in the 80's had a large hand painted sign on it that was beautifully done, for the guy painting it the job was nothing special that's just how it was done. Today it seems anything but vinyl is almost unheard of. 1. When the engine, transmission(s) and rear end are clean, it is easier to identify and address an active/new fluid leak or other issue. 2. A factory-fresh appearance on the engine comes as a complete surprise to anyone looking at the tractors when I lift the hood - they think it's a "sleeper." 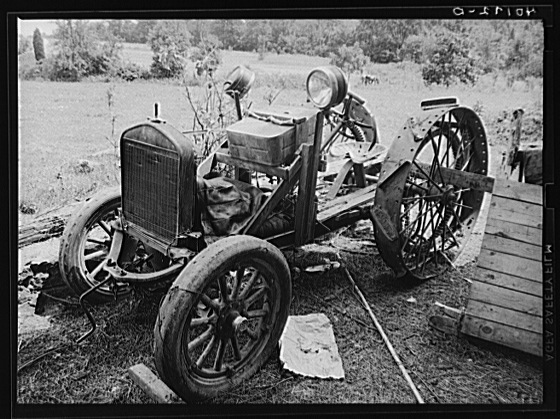 It conveys the amount of work that was put into the restoration and maintenance of the vehicle that is not readily apparent in the bodywork. Great pics and a really nice job Ron!! Thanks for posting those. 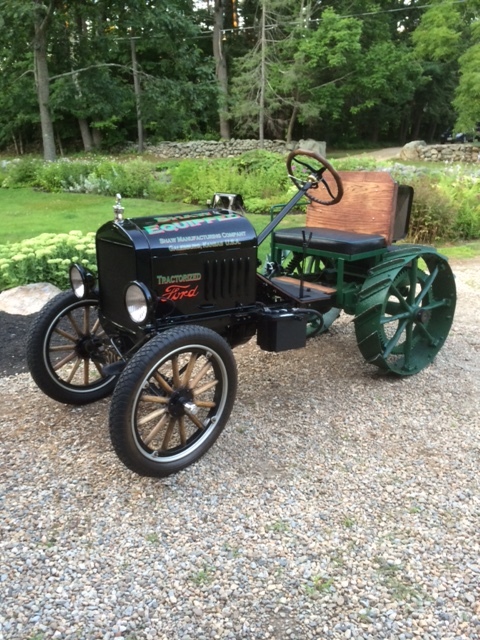 As a matter of fact, I want to thank everyone who have taken the time to post pics of their Model T tractor conversions!! This has become a phenomenal thread with a lot of history and hard work documented and preserved. It is amazing to me there are so many of these. T's are already kind of a smaller, niche crowd. And then Doodlebug/tractors are a niche within that niche. Ron I like that Black Rose a lot. Looks very good. I cannot wait for you to seal the deal on that chain drive so you can post some more pictures of her. She is fantastic and appears to need so very little right now - very well cared for (I have never found one in that nice of shape). I have been chasing another one about 10 miles from my house for the last 4 years. It has a lot of local history associated with it - was built by a Highway Department in an adjacent town during the 30s and used to mow the roadsides in town up until the early 60s. Sickle mower setup on it is similar to yours. The guy who has it is a BIG tractor collector, but not a T-guy. It has been sitting in one of his sheds for years, decaying. 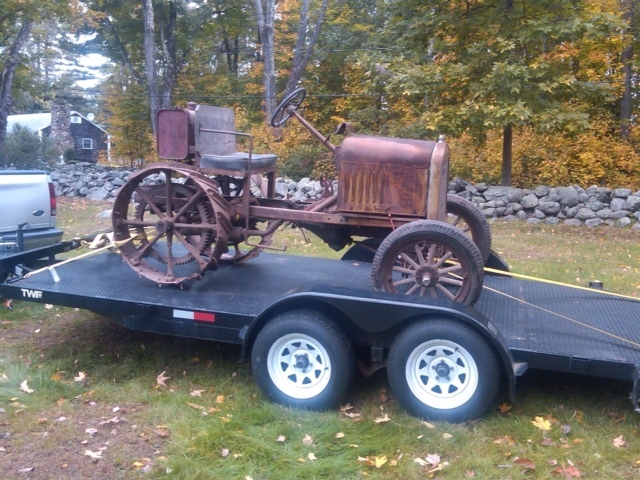 His wife's uncle apparently saved it when the Highway Department was about to junk it, so I guess it has sentimental value to him. But I'm not one to give up, so I continue to chase it - he knows what I do with these and I think he'd like to see it operational again. We'll see. I�ve been messing with doodlebugs for almost 40 years now. 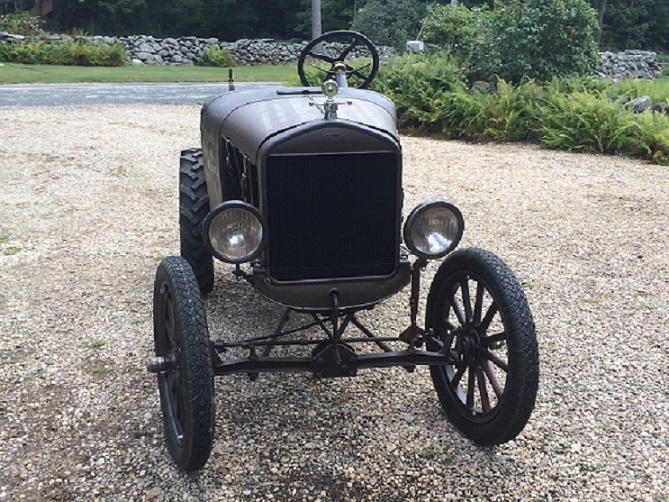 I have a restored 1930 Model A Town Sedan and have previously owned a �24 TT C-Cab, but I have the most fun with the doodlebugs (in fact, that is about all I work on now). 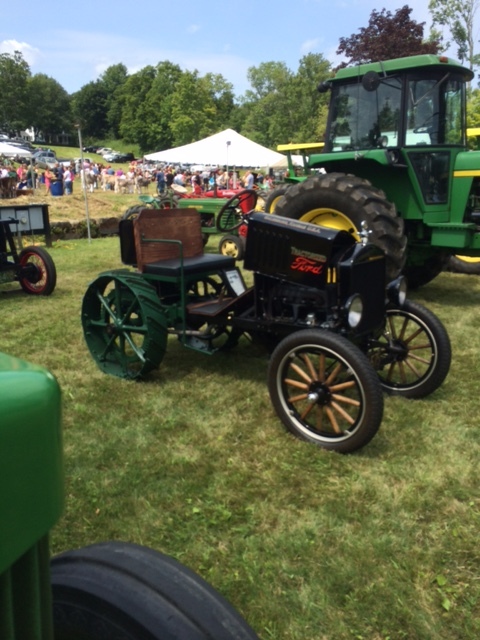 They are a big hit at tractor and car shows; there are no two that are alike and people love to see what home-grown American ingenuity could achieve out of necessity. 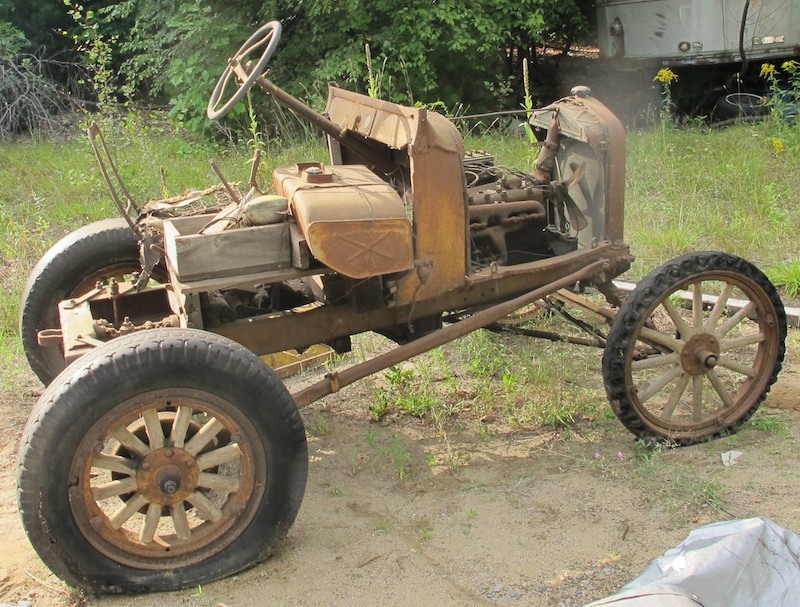 Doodlebugs made from Model As and AAs are not uncommon � although they are getting scarce up her in the northeast (so many were scrapped or stripped for parts used in restorations that they are not as easy to find as they were 40 years ago). T-based doodlebugs have always been harder to find � at least up here. 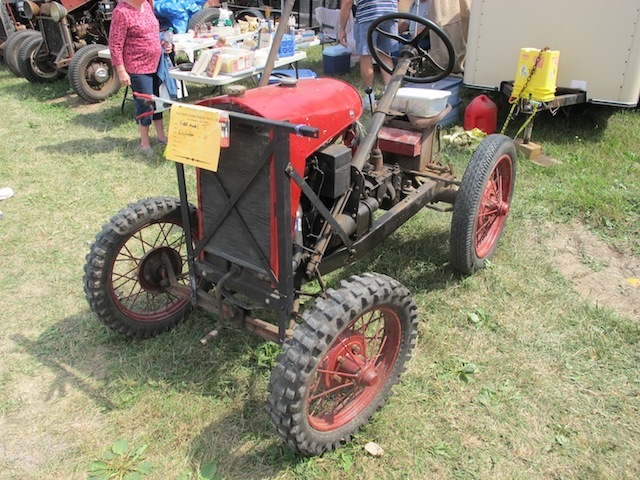 Not sure why that is � there were more Ts made than As and in the �Golden Age� of doodlebug building (the Depression and WW2 � when production tractors were unavailable), Ts were older and more �disposable� than Model As, but Ts are less common today. I will go to considerable lengths and distances to save one when I find them (and I am ALWAYS looking). I don't pull with any of my Ts. 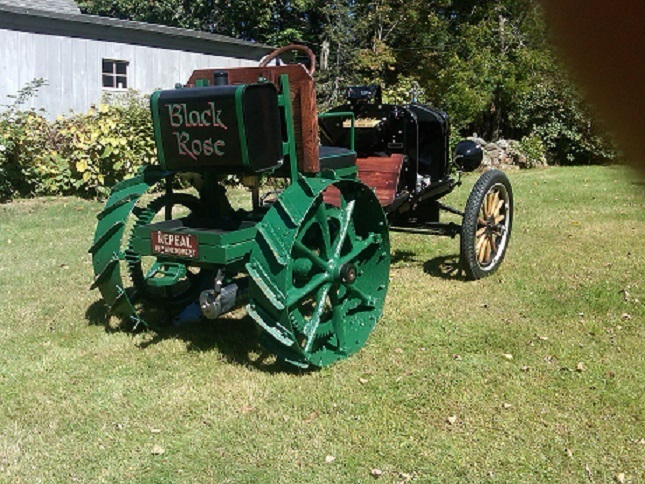 They are largely "retired" (the Black Rose does nothing but clank around shows on her lug wheels and harvest big smiles from spectators) - I do use the Celtic Rust for light yard work and when the T/IHC conversion is finished, I'll use her to mow my pasture. Will probably do some demo cutting with the T saw rig when she's done - same with the T power unit. Interesting, however only one person made half of the sixty posts of this thread. So what's your point Ken? For Ron in Central MASS. John - am glad you haven't forgotten about this pictures! . We may not be thawed out until next fall! Ron, you are the Champion for Doodlebugs. You have vast knowledge, a great collection, and a driving passion for them. I won't tell my wife that you are what got me into these, and I am super stoked to own one now. The best part is, there truly is no right or wrong with these. I try to maintain the spirit of period, but mine will have a few modern items, such as a 2" receiver hitch--because then I can actually make it useful for my needs. Still glad to see there is some interest maintained on here, even if it is only a few of us. Chad - the best part of these threads was watching your acquisition unfold! I think it was a total of 7 days from your initial message of "I want one" to you posting pictures of her sitting on your trailer next to your garage - was absolutely fantastic! 56 temp this afternoon! Got new internet today! First thread I've seen since Feb. 23 was Doodlebug related. Went down to barn and started mine up. Drove it up to the house so I can look at it. I really enjoy this thread. Keep it coming! You're a lucky man Mike! Mine are still snow prisoners. Who would have thought that Iowa would be warmer than Massachusetts in March? 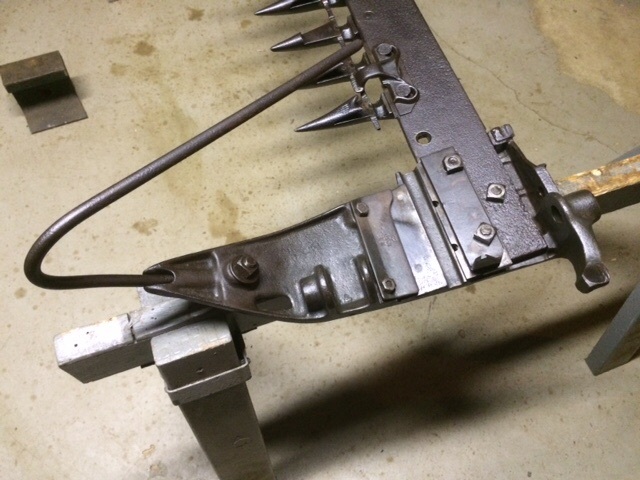 Spent the weekend working on the sickle bar for the '27 T/ IHC mower conversion. Removed the skids, main mount, blade and all 22 knife guides for cleaning and linseed treatment. 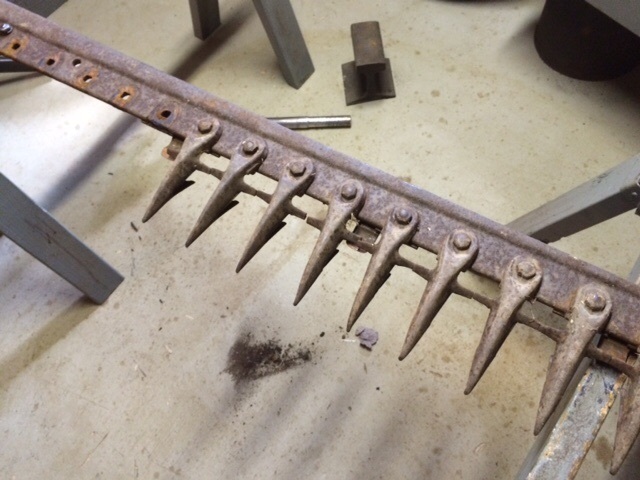 Two questions are raised for me: do you intend to get the sickle bar functional (I hope so) and two, how do you resurrect a sickle bar from a rusty death? it seems like it would take very little rust to destroy the necessary shear edges requiring new parts that even if they are available might be a bit pricy when multiplied by 22. I am a little scared of the cost of making the sickle bar functional on the 'bug that I posted a while back, that bar is even bent from the roof that had fallen on it some time back. I somehow doubt that the bar can even be straightened in a reasonable fashion so I might just shop along side the road/woods for a straight one. I absolutely intend on getting the sickle bar functional. The pictures above were midway through disassembly. 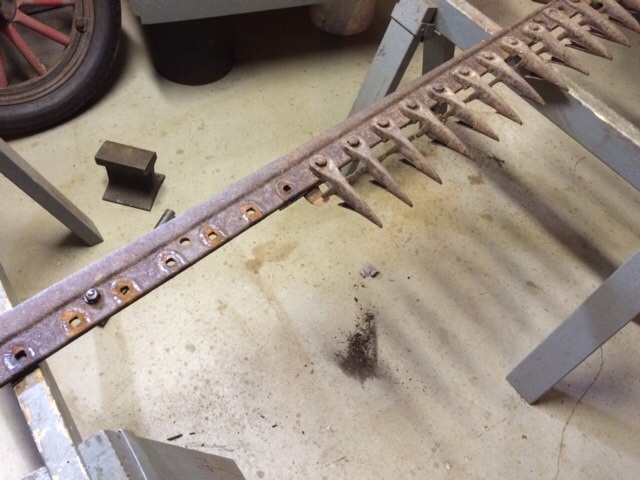 The cutting bar was complete - couple of pieces damaged, but nothing that would prevent it from functioning. It was detached from the doodlebug and had been been for sometime. 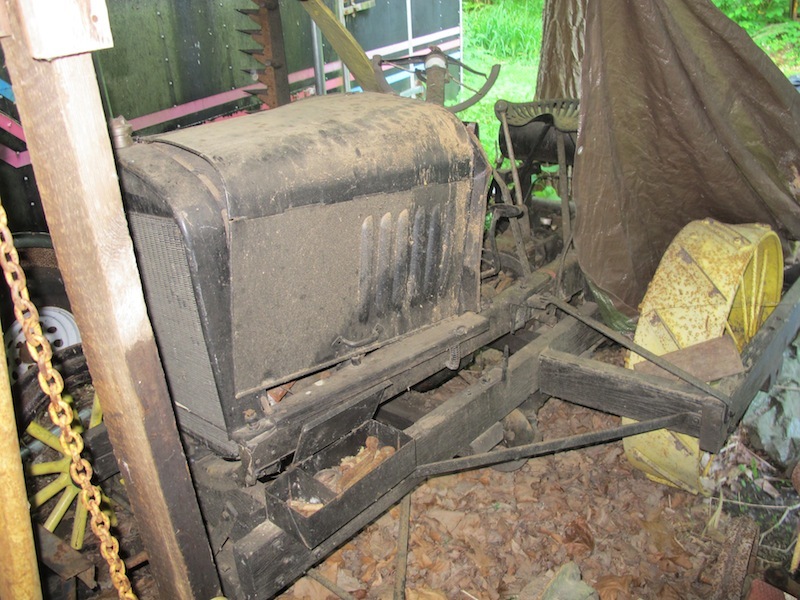 First step was identifying what model of IHC mower was used in building the tractor. I copied down some of the part numbers and posted them to a couple of vintage tractor & farm implement forums. 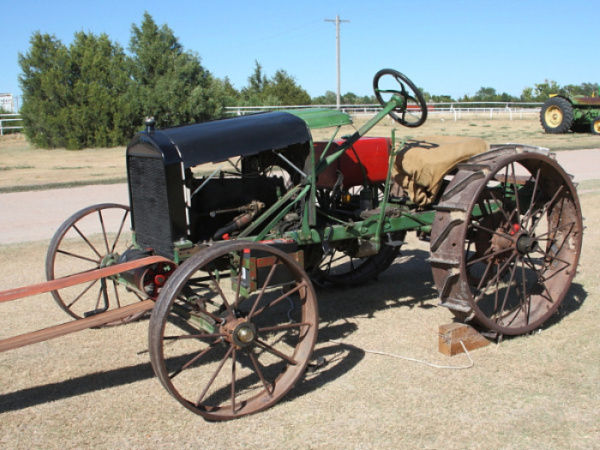 A participant on one of those sites had a PN cross-reference book and identified it as a McCormick-Deering/IHC "New Ideal" horse-drawn mower which was produced from around 1895 to 1925. I have used that info to search for the parts (only one of which I would describe as expensive - a small drive gear that attaches to the T axle which had a couple of teeth chipped off it). 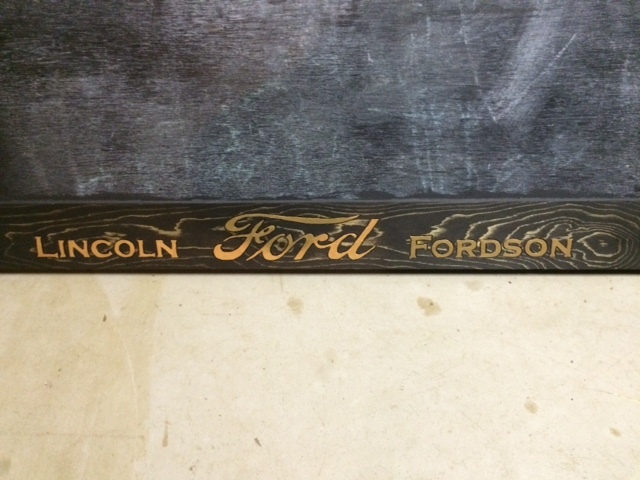 Of the 22 knife guides/teeth, 20 are original IHC (stamped right in - IHC was a diligent as Ford in marking their parts with a logo) and two were John Deere replacements (could tell by the green paint remnants) - so it would seem there is a certain degree of standardization. Totally disassembled everything - mounts, blade, guides - until it was just the main bar. 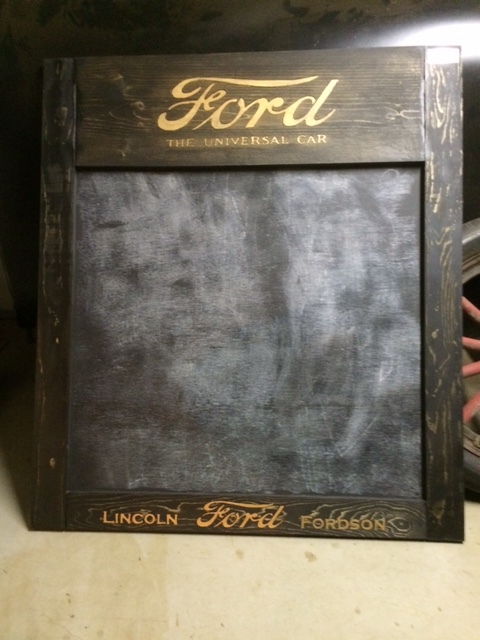 I hit everything with a wire wheel and then treated with linseed oil (I'll post some update pictures later this week). 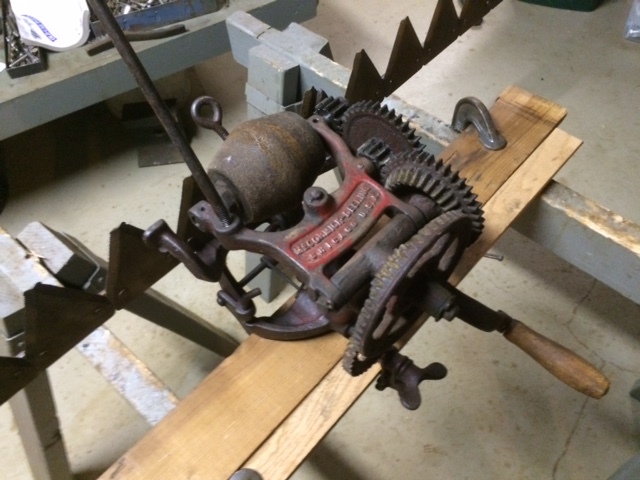 The main cutting blade is in good shape and I just found a McCormick-Deering sickle bar sharpener that I'll run it through before final reassembly. Zac - that had to been one hell of a heavy roof to bend the steering column and the sickle bar! The bar on my system is about 1/2 - 3/4" (there is a bevel along one edge) of cold rolled steel. I would try and straightening it before anything else, as I am not sure how interchangeable the bar is with the main mount and you may be roadside shopping for a while. Any blacksmiths in your area? 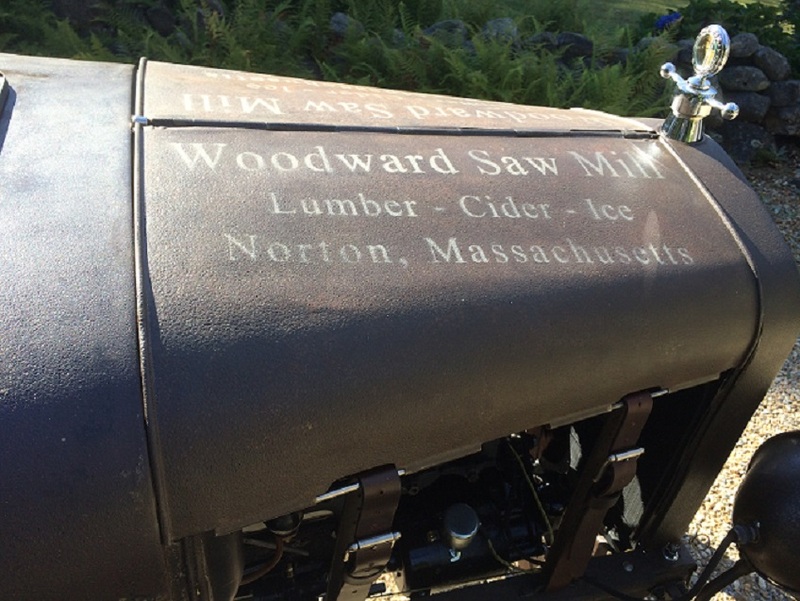 Guy in the next town over from me is a full-time blacksmith and he can do some pretty amazing things. Donnie - thank you for those comments! I'll certainly continue to post and am glad there are people out there who enjoy this thread. Those who take exception to the amount I post on here are welcome to either read other threads or contribute something meaningful and relevant to this one themselves (who knows, maybe the blonde pictured above has two transmissions and a shortened frame). 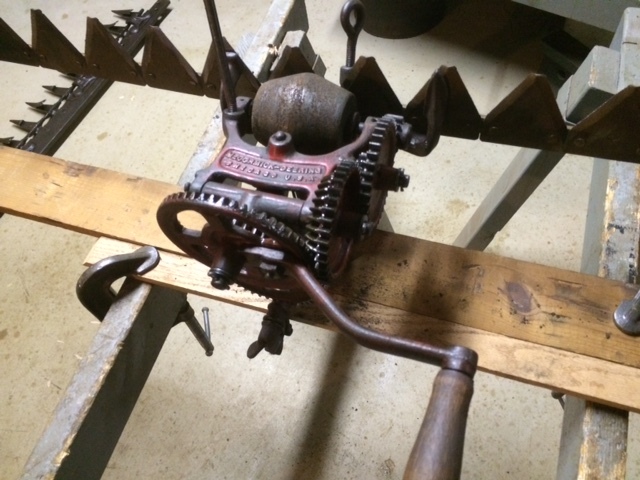 Here is a picture from the previous owner with the sickle cutter mounted. 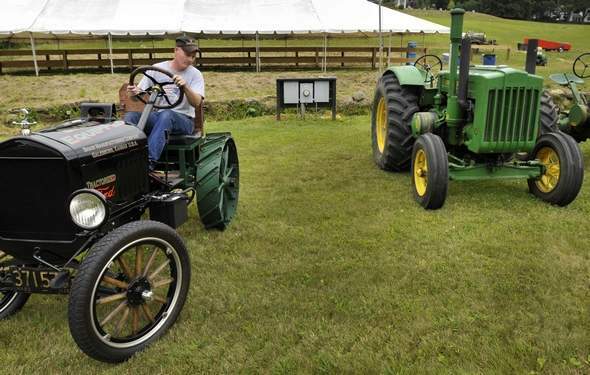 The tractor was used to mow hay in upstate NY until the mid-70s. 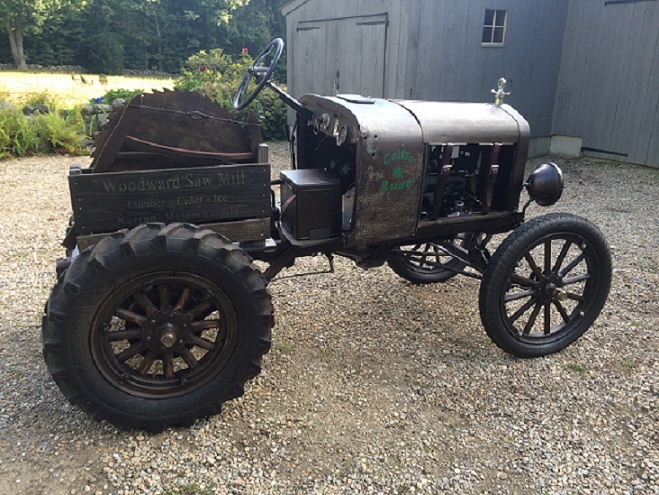 When he purchased the tractor and transported it to Pennsylvania, he removed the sickle bar. 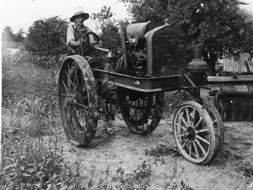 Judging from the length of the blade and the wheelbase on the tractor, I cannot imagine the balance being particularly good - anticipating an enormous amount of vibration when the sickle bar is attached and subsequently engaged for cutting. We'll see. Ron - Concerning people out there who enjoy this thread, count me among them. While I've never had a T tractor or other implement, I do enjoy them and these threads too. Thanks Keith, will do! And thank you for helping me with some parts for these projects! Reexamined the pictures of your mower doodlebug. I definitely see the bend in the cutting bar about which you are referring. I really think you could strip that bar and straighten it - trying certainly wouldn't make things any worse. The cutting blade appears to be removed - which is a good thing (if he still has it). Mine appears to be tempered, which would be more difficult to straighten. Im with Keith on enjoying these Doodlebug threads!! I had a couple of A's and one chevy 490 but never a T.Be careful working on that cutter bar where you put your fingers when you fold it up!!!!!!!!!!!!!!!!!! Most cutter bars would [droop! Bud in Wheeler,Mi. Bud - thank you!! Chevy doodlebugs are as rare as ones made from a T up here; seldom do you see anything other than an A or AA-based machine. Will do on the cutter bar. Latest pics of the cutter bar. I just love boiled linseed oil!! If I never touch a rattle can again, that's fine with me!! All the knife guides cleaned, oiled and reattached, bar cleaned and oiled, pivot mount cleaned, oiled and reattached. Still working the cutting blade and the exterior skid. More pictures as this progresses. I didn't quite get it that the unique shine of the rust on Celtic rust was linseed oil until now, it does seem to make a fine finish for this type of thing. -looking good! Yes, I will try to straighten the arm first, but I am not entirely holding hope that it will be good enough for the shear edges to work well. Good to see that the warmer weather is letting you get out to the shop. I am going to have to give the linseed oil a try. Do you just brush it on and let it dry? Zac - still too cold for the garage. I squirreled all sorts of T projects away in the basement last fall so I wouldn't lose my mind over the winter when the garage was too cold to work. Linseed oil has been used by farmers for years to protect equipment that is exposed to the elements, so in addition to all it's other advantages (cheap, easy to apply, easy to touch up, "eco-friendly," etc) , it is "period-correct" for what we do. Chad, I remove bulk rust with a wire brush and wipe clean. I take a Snapple bottle and fill it roughly 3/4s full of pure boiled linseed oil straight from the can. I then fill the remainder with mineral spirits and shake. I apply the mixture with a chip brush (which I keep submerged in the Snapple bottle once the level drops a bit). I stretch each brush load out as far as it will go, working it into every crack, seam and rust pit (the chip brush works well for getting it into pits). Stretching each brush load is important because you will later wipe away excess - and why waste more than you need? Non-rusted, bare metal is coated as well, but you won't see the dramatic color change you will with rusted areas. I then let the piece set for an hour or so and wipe off the excess. If you do not wipe off the excess, it will become gummy and take longer to dry. The mineral spirits mitigate the gumminess somewhat (as well as make the oil easier to spread, shorten the drying time and reduce the sheen), but you have to wipe the excess off or prepare yourself for an extended drying period. BTW - everything on the Celtic Rust (minus the engine and tires) was treated as I went through her over the course of a year. Total expenditure on linseed oil was two Snapple bottles as described above. The finish will last 3 or so years (your mileage may vary). Put a scratch in your ride? 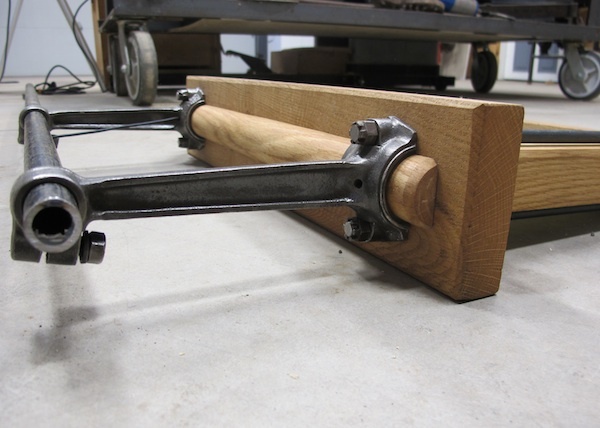 Touchup is merely a matter of wiping a dab of linseed oil over it and the scratch is gone. You can avoid a complete recoat by routine wipe-downs. Additional note: linseed-soaked rags are HIGHLY combustible until they thoroughly dry (they have been known to self-combust if left in a pile). When I am done with a wiping rag, I submerge it in a bucket of water and leave it there until final disposal. Thank you for the detailed oiling process. And those rags will burn: my father left some rags in a pile when he was building his house, they were smoking when he returned but luckily they had not become fully consumed. -He actually seems to have a talent for starting fires like this, While sanding the floors in my house before an additional coat of finish the dust bag caught fire. Since the polyurethane was plenty hard enough to walk on and sand that means most of the reaction had already taken place but there was still plenty of heat generated to start a fire. Amazing how these exothermic reactions that are innocuous when spread out become dangerous when the area is confined. I woke the doodlebug from it's winter nap and practiced a little driving in my driveway. I need to get some T-driving in, as this is really the first driving I have done, so learning all the levers and pedal coordination is the topic of the day. Yes, that is right, even though I now own two T's and have had one of them for ten years, I have never really driven them. Time to jump in and get out there. Congratulations Chad!! Mine are still snow prisoners - probably see them in July when all of this finally melts away. Dennis - that was me who mentioned the vibration. I will keep your advice about RPMs in mind when I hook the bar back up to the T. Let me ask you thius, how does a sickle bar fare in brush/bramble? 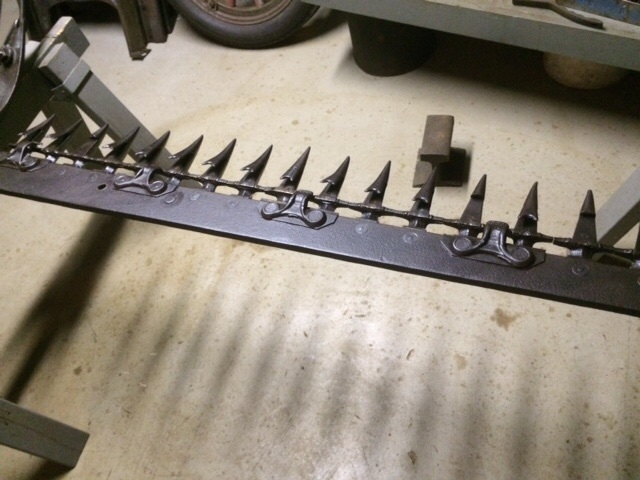 A sickle bar mower is not a chain saw and should not be used like one. Small twigs and fiberous woody type plants like thorn bushes, cat tails, and broom grass can be cut with a cycle bar mower but bigger twigs and branches should be avoided. If you have property that you purchased that has had clumps of brush in a field area it is best to check for junk that the previous owners may have mowed around for years or it may be a stone pile from clearing a farm field. One problem new operators tend to do is set it too low and it digs into the dirt. Be sure to set it so it is not too low. If a sickle bar gets plugged up with high grass you don't always have to get off and unplug it sometimes you can get the blade to clear itself just by backing up. Never leave the mower run if you get off the equipment because you can stumble and be injured very quickly. Children and others should not be allowed to be near the mower when it is operation. Sorry for the preaching but I have assisted rescue squads dealing with severed limbs and fingers and it is not a very nice sight. Dennis - thank you for all of that. I have a lot of bramble on my property that I currently cut back with a weed whacker in the fall. Was intending to use the mower doodlebug to do this in the future, so all of the info you provided above is exceptionally useful. Ron,I don't know what to use but spray help?? Remember not to get your fingers in the gaurds when fold up the bar!!!!!!!!!!!!!!! Bud in Wheeler,Mi. Good Advice Bud, You've obviously run one of these. Fred,When i was a kid we had a horse drawn JD with a 6' cutter bar.No pto so you had to watch your starts but our C Allis would make those square corners without missing a beat!! Much more fun is raking hay that was rained on! With the right amount of rake and the right speed you could turn the hay upside down to dry!! Fun in third round and round! Bud in Wheeler,Mi. Bud - the spray would probably keep the brambles back, but cutting them with a T doodlebug equipped with an IHC mower is a hell of a lot more fun! I will be careful when folding the bar. I am home sick today thus laying here bored and a bit sore..
Ron, nice sharpener. I know I have seen those before but I am not sure I realized what they were used for. Per an earlier comment about roadside shopping for a straight sickle bar, I counted how many I pass that are within eyesight of the road on my drive to work. -I came up with 13 in 31 miles. Plus there are two more in the woods next door. I wish T's were this easy to find. The number is a bit skewed because 7 of them are at a closed John Deere dealership along the way. 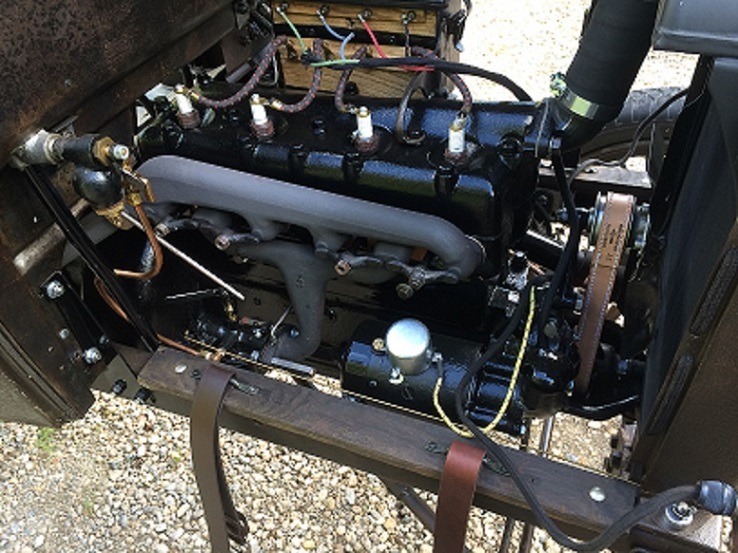 The owner of the dealership has had a stroke and is pretty well gone mentally, but a small engine club uses the site to put on an engine show in summer. The family opens up the building to wander through the collection of tractors inside. The neatest tractor is one that was produced as a training model back in the late 1950's and has just about every part cut away so that you can see how everything works. Zac, hope you're on the mend soon. If you come across any of these yard art pieces marked "New Ideal," let me know. 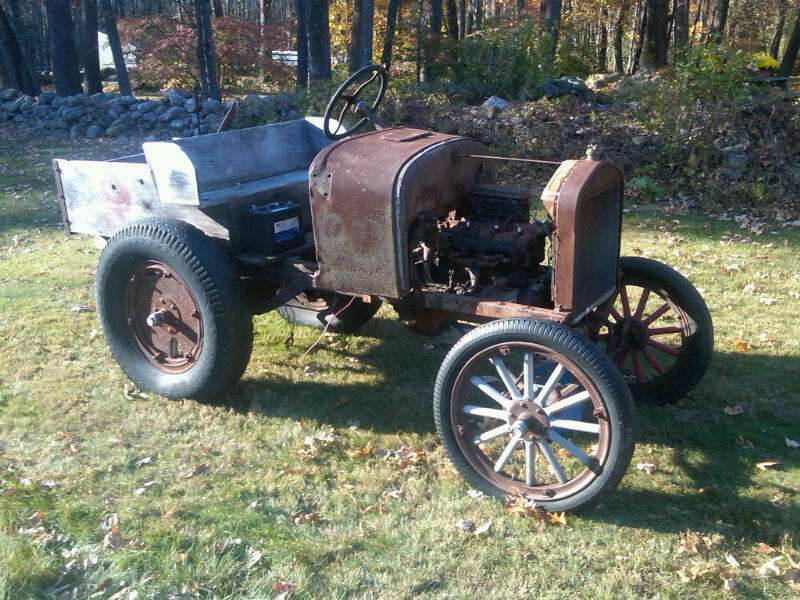 The system that was used in building my bug was an IHC "New Ideal" mower and I need some parts to keep as bench stock - specifically the drive gear that fits to the T axle (IHC PN: D730). Not a T, but a neat take on mower mounting. Part of that address refused to hyperlink - you'll have to cut & paste. I have run into that collection a few years ago, and have looked through it recently. That person must have ferreted out most of the doodle bug pics on the web. Thank you for posting that link. I had not seen it before. 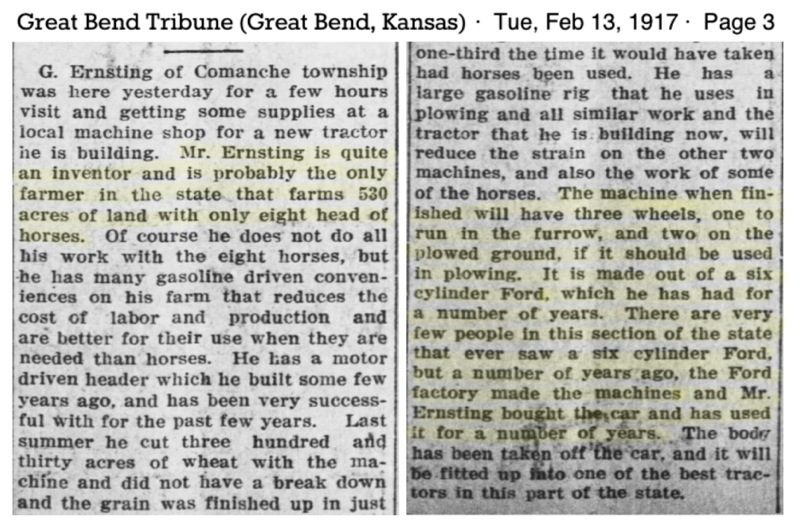 It was nice to see two photos of my Dad plowing with his Model A "Hoopie" on page 27. 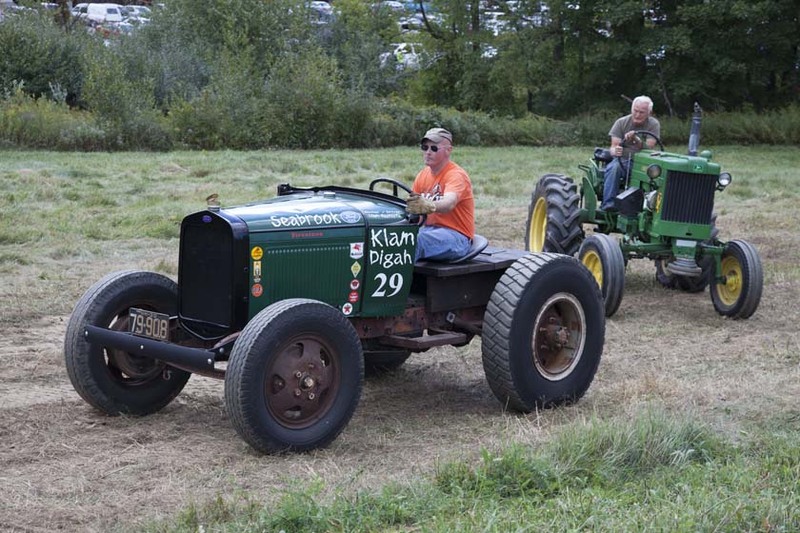 It is the only one I have ever seen with the steering modified so the column is horizontal over top of the hood and the driver sets centered on the tractor. Going to need some time to digest all of that. 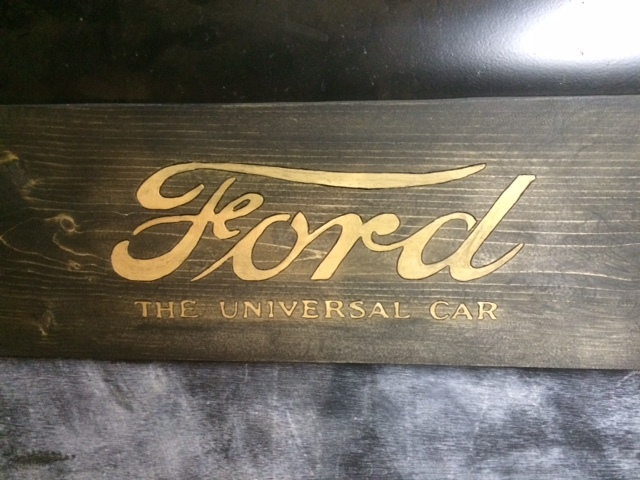 I find it amazing so many are Ford A based---maybe because it was an easier, more "modern" car to use for most people? It's simple i think as the model A was still in high usage during the war and when the demand was high for tractors the A was there! 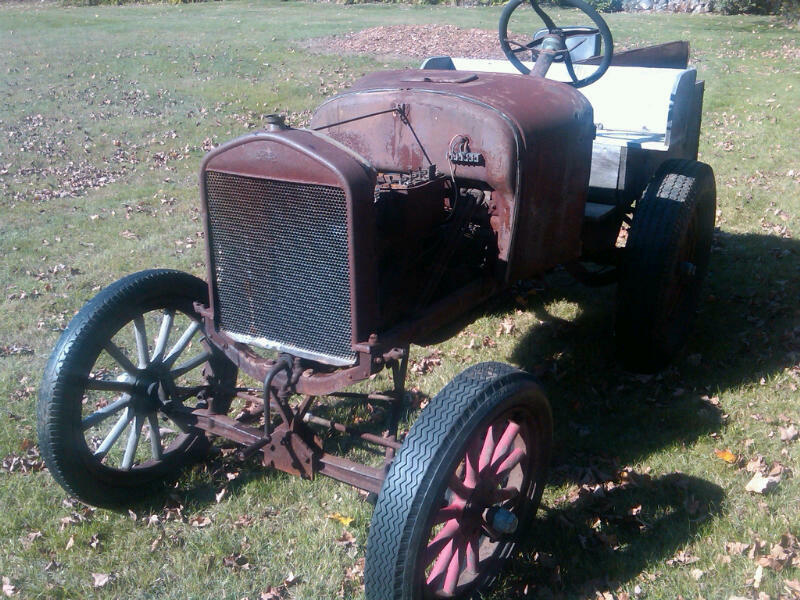 The model A was a very well built car/truck! Whatever brand the last bug pictured is i love that live power! !Bud in Wheeler,Mi. That is really neat that you found pictures of your Dad in that collection. I just went to that page and looked at those pictures. Is the doodlebug still in the family? Again, for some reason, only part of the addresses actually hyperlink when I transfer them here - so you'll have to cut & paste into your browser (definitely worth the effort). 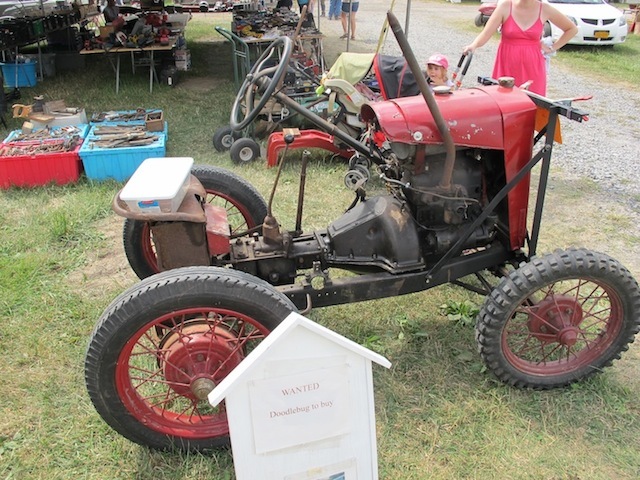 You get the sense from some of the pictures that vintage homemade tractors are a BIG deal in Europe - looks like there are entire meets & shows with nothing but doodlebugs. Google translate makes it *almost* readable for english speakers, it's the text headlined by "Brind�straktorn". Ron, Dad's doodlebug was scrapped in the 1960's I think. It had always sat outside and was in bad shape. I wish we would have saved it. I still have the seat, radiator and radiator shell. 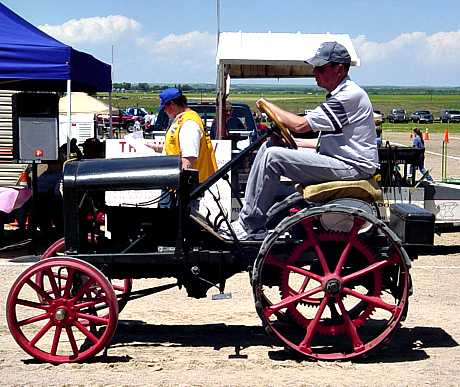 I have the original photos of him plowing so I must have posted them in an old doodlebug thread. Can I play? I've been known to dominate "OT" threads too. One of my first jobs on our farm was to rake with our 9N Ford, so I can relate to some of the posts. Rob, that certainly would have been a site to see. It really is to bad there isn't a pic of that machine. Ron, your link really sparked things here... Apparently there are lots of people (like us) who will sift through hours of doodlebug pictures, so I will also throw this link out there too (of course after looking at the previous link many will be doubles). HELL yes you can play!!! I labeled the original threads last year "Show Us Your T Doodlebugs...." but just noticed that I have not done that with the recent ones. So I guess they are technically "OT." 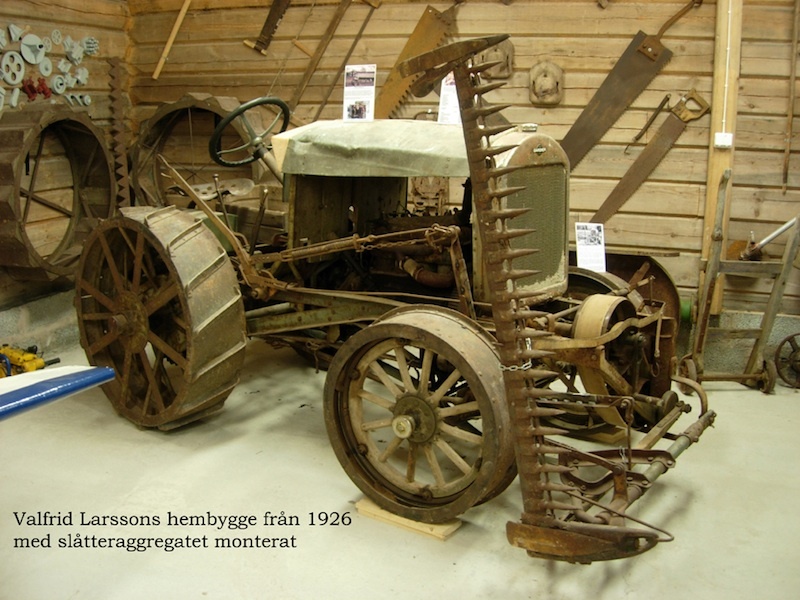 Some of the albums put together by the gentleman in Sweden show tractors made from some really early vehicles, but I don't think there is anything in any of them that is as old as a Model K. I would like to see what that looked like. Zac - so I clicked on Jim's name from those posts to bring up a user profile and send him a PM. No profile came up - it went directly to an email address. I sent a note to that email address and it bounced back as "undeliverable." 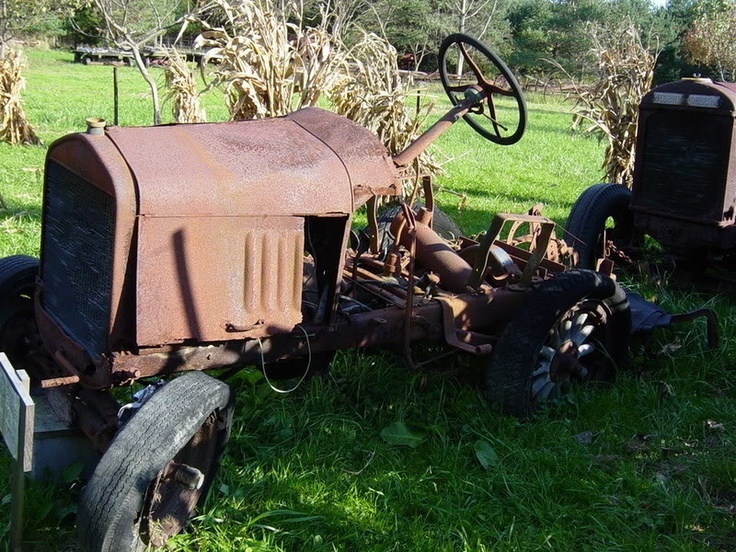 Maybe someone on here knows Jim and can either ask him to refresh his account and join this discussion, or at least give an update on the fate of Jim's tractor. I agree with you, it is exceptionally unique and hope it was saved. -I didn't expect you to get on that so quickly I was half joking when I elected you, but in al sincerity it is too bad that the email bounced, I really would love to hear the whole story. I have little doubt that Jim's tractor and this one are one in the same. If not there is an uncanny resemblance to the wood pulleys and other details. The only difference is that the hood was not on in the "before" images, but Jim mentioned it in the thread and the wheels are different possibly owing to sitting and rusting? Possibly the cuts in the wheels visible in the before images gave concern? or the aggressive lug pattern for a tractor unlikely to be used for heavy pulling was just too much. 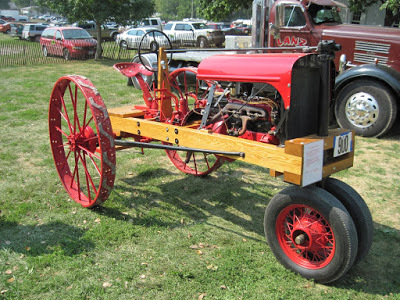 The use of wood elements in any of these doodlebugs/tractors/early vehicles really makes me rethink the role of wood, not that I am quite foolish enough to suggest wood cars for 70+ mph travel on today's highways. I have never counted myself as a creative individual, others often confuse things I do as creative but I tend to be good at seeing neat things that others have done then varying on their theme/recombining them with other ideas. This tractor alone gives me enough ideas to keep busy for a long time. I hold a great deal of respect for the person who looked at logs and parts to see this end with no likely pattern to model from (excepting the row crop tractors of the day for obvious styling cues). What can you guys tell me about laws on driving Doodlebugs on the road? I have heard that a slow moving vehicle triangle is all you need if you stay under 15 mph, kind of like a tractor. I think it depends on laws in your state and probably county--as well as what the officer feels like that day. Being I don't have a large amount of property, but have secondary roads that I am on and around me, I plan on the triangle and not using the roads during peak hours. I have a gas station a quarter mile from the house, I don't see an issue going there with it to fill it up--but again, it will probably be at the officers discretion if I am caught. I am/have been looking into it a little bit, but to be honest I don't want to have to pay for another annual registration, the state gets enough money out of me with 6 vehicles and a car trailer already--as well as insurance. My only concern is showing ownership. Lonnie - I think it varies from state to state. I live in the country (town of less than 1,500 people in Central Massachusetts) and routinely take my doodlebugs on the back roads near my house. They are not registered and none of them carry a triangle. Never had an issue - my neighbors are numb to them and passersby are too busy staring and smiling to complain or call local law enforcement. 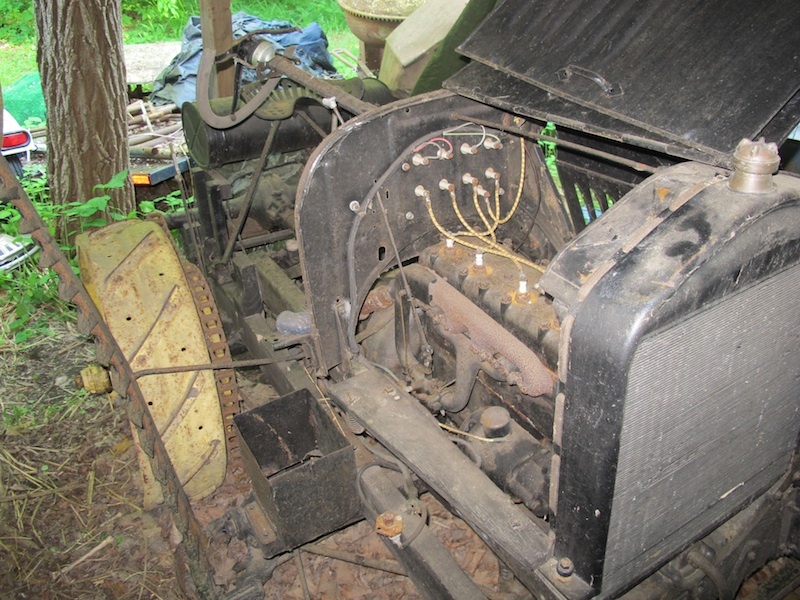 Previous police chief here had been in office over 30 years and would periodically stop to BS - he was a car guy and had a defunct '28 Model AA doodlebug that belonged to his brother and now sits decaying behind his property (real shame too - had been made from an early AA). He has since retired, but have had no problems with his replacement. Now that I've said that, am sure I'll be ticketed sometime this spring when the snow melts. Zac - think you're right - that is probably Jim's tractor. Cannot be two homemade jobs like that. Lonnie, you could easily open a big can of worms with this one! I would love to fully support the "a triangle = free joy riding" based law but I don't really see it happening. Many roads are too fast and driving a regular T is risky enough some days. My bottom line feeling is that if an officer wanted to make a big deal about it you wouldn't stand a chance. Remember: if there were an accident you have zero insurance and are not registered with the state. I regularly drive the roughly 800 feet from my house down to the roadway into the saw mill/woods with the 'bug even though I could stay on an all dirt route. Sometimes the ground is soft and I don't want to damage the pasture/yard. I think as a society we have just gotten too mired down in strict adherence to far too many laws that are effectively asinine and degrade common sense. I suppose this could be considered my little way of saying if this is legal, great it should be; if not then consider it my little stand against poor application of law. Should I have to trailer the bug for this sort of trip each time!? Further, there used to be a town car show about a mile up the road in what was once a cow pasture (now mostly houses), even for this type of activity is it really reasonable to trailer the 'bug there? Stuff like that just seems silly to me and law should accommodate it. If no one pushes back it seems that your rights get taken away these days even if it is something pretty trivial. -Amazingly (sadly? )I just spent an hour trying to ensure my wording was cautious/accurate/brief on this post, it still reads poorly and is long winded! Zac - it's the T doodlebug thread!! No here one is judging you by the length of post or whether you run a water pump. LOL, just like our 'bugs, we are never correct. To add to my post of driving on roads, I think some caution and good judgment is in order before proceeding. My roads are 30MPH speed limit, even though most seem to do 40-45mph. Again, on a early Saturday--or even better Sunday morning, I would have no issue going out. But the local constable could easily have something to say about it if he/she wanted to. I will be looking into this a little bit more from a NYS perspective. How does everyone feel about child labor? My daughter helped me take the engine out of the doodlebug Saturday/Sunday afternoon. I was surprised she stuck with me and didn't lose interest. This engine is more or less untested. I know it will run but I am not sure how tired it is, hoping to buy some time before having to rebuild the "original" engine. Zac - that is one tough little lady you have there. Wasn't the warmest weekend for pulling engines and she's a trooper for hanging in there. Most of mine have tired engines (my '28 has a really tired engine and it's been that way for 40 years). I nurse the tired ones along; they are good enough for my purposes and what they do now - shows, light yard work. Of the doodlebugs, the AA has the best engine and I pull with her. Celtic Rust is pretty good and so is the Shaw. With the going price of a rebuild anywhere from 4-6K these days, rebuilds are not an option. The engine on my Town Sedan was rebuilt in 1978 at a cost $800 and probably has less than 7K miles on the rebuild - still sounds like a watch. Great little helper you have there, enjoy it while it lasts. What size tires are on the rear of that bug? Lonnie - I think those are 7.50X20. I run the same thing on one of my bugs because I saw these on Zac's. They look spectacular with TT wheels. Yes pretty cold, she picked up a piece of ice then touched metal and stuck to it when she was getting me a wrench it was pretty funny. We may not have the sun on this side of the garage but most of the wind is blocked so that helps. The other engine was too tired, ran great but it was fogging for mosquitoes pretty bad... I think the bottom end is still fine, but it needs a .020 bore and new valve guides/seats. You can just rock the valves side to side in it. I saw Ron's tires and liked them, not knowing he had seen Zac's. But I was hooked on them too, so I also now have a set although mine will be on a 16" steel wheel--tires are 8.0 x 16. I bought mine from Nebraska Tire on Ron's recommendation, they had the best price and were helpful. My T/IHC mower has T front wheels that have been cut down to 16" and fitted to a lock-ring style split rim (T hubs and spokes). They have "S-3" Firestone motorcycle tires (rotted away) on them. S-3 were apparently used on military motorcycles in WW2. Have a set of knobbys to put on once I can pull her out of her snow prison. Chad, I shopped local 85$ total for both! The tires were pure luck really. I stopped by PCI tire in Schenectady NY because I knew they serviced commercial trucks, I was planning on getting some old truck tires and cutting some grooves in them for tread I figured that would be free. The employee who was helping me asked what I was using the tires for and I showed him the T rim and he said he thought he might have something for me. when he came out he had a brand new (old) Armstrong tire. at one point PCI had quite a few Ag customers but as farming disappeared they quit selling Ag tires this one had been sitting around since the 90's. I had unfortunately found out that I was going to be loosing my job about a week before, so I was really looking for scrap/free tires but a tube and tire for 65$ was pretty good (and my job did get saved 3 months later... I quit 4 months later, the writing was on the wall and I was not going to be last off the ship). The second (inexpensive) tire was the hard one to find, it was pure luck too. I was driving by an old farm that had been cut apart when a road was moved to make it straighter. laying in the grass was a tire that looked about right so I pulled onto the old section of road and into the drive only to see that the house had just been sold and was empty. As I was backing out I noticed the farm across the road had tons of tires, it turned out the guy there sold new and used Ag tires, he had a used 20 7.00 for 25$ it is not in super condition, but the price sure is super. The tube I am using with the old Ag tire is the original red rubber inner tube from the doodlebug as I found it with a large rip in the side wall of the tire from sitting! It remarkably holds air better than any other tire I own. I wish they made rubber (and real rubber it is) like that now! I can never get great deals like that, LOL. But, after shopping around and finding most used ones were near the price of new ones, I decided to bite the bullet and get new. I saved a little on the fronts, they are mini spares from a newer car. The 'bug will never exceed the 55mph rating, they are new and soft, and will fit on my 1935 17" spoke Chevy truck wheels. As with the rear, I am using some billet aluminum adapters from Ebay to attach the wheels to the T hubs. This was the driver side tire, it was so stiff it never even had a tube in it! But it did come with something else! Good thinking, I never would have thought of wheel adapters for a T on ebay! I think that if I ever need to do front wheels with pneumatic tires I will try to find some used dirt bike tires, they will be plenty tough and would have neat tread. Zac and Ron - i am with you guys on the whole driving on the roads thing. Common sense should prevail more often than it probably does.. and the occasional driving of an old T\Doodle\tractor on secondary roads shouldnt be a problem anywhere. My in-laws live in Foxboro Ma. and every year we drive the tractors and Toro doodlebug from my inlaws house up to the center of town for the annual Foxboro Founders Day parade. It's a good 3+ mile trip each way... people slow down and wave or just pass us, and the police don't harass us one bit. Its the one day of the year where the machines go out on the road that i dont have that "is someone going to complain" feeling in the pit of my stomach. Also - its great to see guys getting their kids involved... whether they are just hanging around or actually helping. 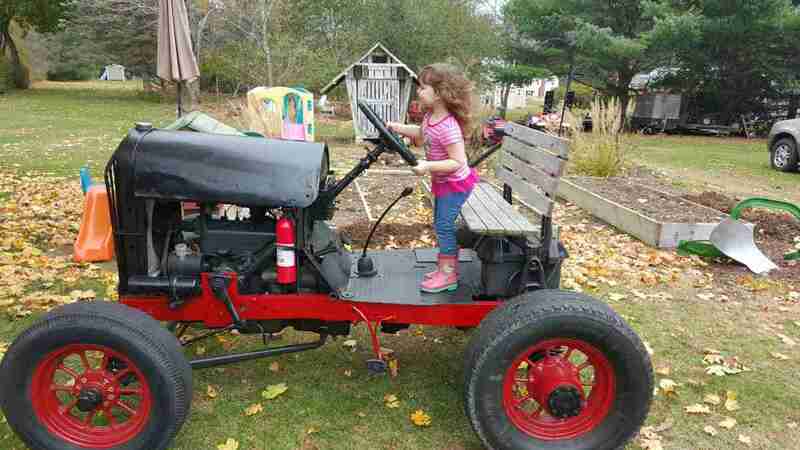 Here is a picture of my 3 year old daughter playing on the '31 Toro Doodlebug.